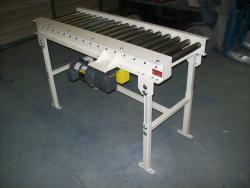 In general product take off tables are bespoke to each Pultrusion installation. Pultrex engineers will design and supply units suitable for each customers needs. The design is centred around a standard motorised roller conveyor fitted with rubber drive rollers to provide a frictional product pulling action. Pneumatically operated flippers then transfer product from the roller section into an output bin ready for the next manufacturing operation. Each take off table can be powered by and interfaced to the Pultrusion machine, to ensure reliable and accurate actuation.